Having designed a logo for India the previous, India came back to have a custom website built by us the following year. India Gillan offers elite permanent make-up and cosmetic beauty treatments in Kent. 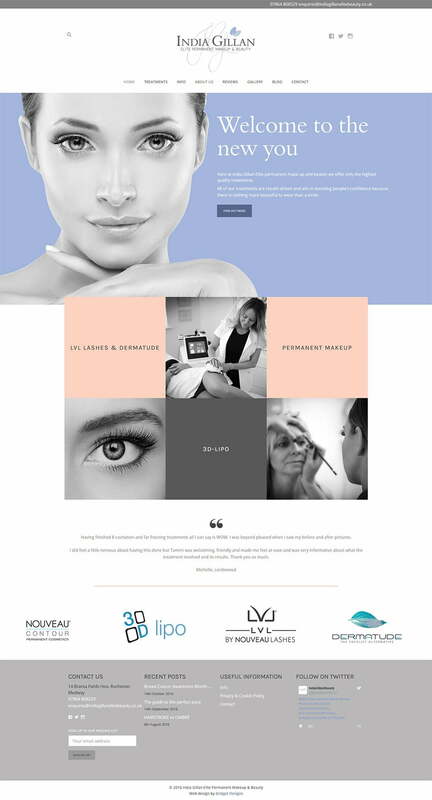 She wanted a high end, clean, contemporary design for her website that matched the sophisticated feel of her logo design. The beautiful, minimalist design features each of her services and a gallery of her work, before and after. The website also features a blog and reviews section and is linked to a mailing list on Mailchimp. After Bridget designed my beautiful logo one year ago I had my heart set on her doing my website! As soon as the time was right I contacted Bridget and we made a start working together on my website. She asked me so much about what I was expecting from her and what image I wanted to portray for my business, it was perfect. Once I saw the first preview of the home page I knew she had hit the nail on the head with what I wanted, so you can imagine my reaction when I saw the finished product! It was perfect, classy and so professional. Bridget takes her time to make sure you are 100% happy and it was definitely worth the wait! I cannot thank her enough for how easy she made the process and her artistic skills. My website makes me so proud of my business and that’s all down to Bridget Designs, so thank you so much!